Puustelli Group Oy has been granted a European patent for Miinus furniture system inventions. The furniture parts and particularly the structures of the cabinet carcass include many patented details. The Miinus invention is the most important innovation in the global furniture industry for decades. Recyclable biocomposite has replaced the MDF and chipboard traditionally widely used as carcass materials in furniture. The raw material is made in Finland and consists of a polypropylene and pulp fibre compound. The side components of the patented structure are made by injection moulding. Whereas the invention allows for various types and sizes of frame parts to be made, each part requires a separate mould. The colours of the moulded parts can be flexibly varied. Thanks to the injection moulding method and choice of material, the components have excellent precision and strength, as well as excellent moisture resistance. Besides which, material waste is minimal. The material releases no toxic emissions into the indoor air and retains its dimensional stability, strength and colours also in highly challenging conditions. Holes to join the carcasses and to fasten hinges, mechanisms and drawer sliders have been ready made in conjunction with mould injection of the frame. Biocomposite is not subject to fatigue and the structures have excellent modifiability. For example, a cabinet can be transformed into drawers and the other way around without completely removing the carcass. Since the holes have been ready made, fastening the screws couldn’t be easier when making changes. The parts remain firmly in place in a Miinus carcass far better than in traditional chipboard. And unlike a chipboard carcass, the Miinus carcass can withstand being removed, transferred and re-fastening numerous times. With the Miinus kitchen all unnecessary material has been removed, minused. The kitchen’s weight (mass) is about half that of a comparable kitchen. This makes it lighter to handle, install and transport. Which is also why the carbon footprint originating in transport is almost half that of a typical kitchen. 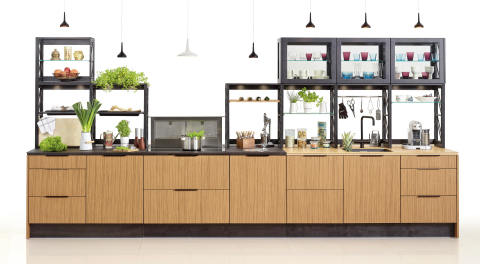 Recyclability, carbon footprint calculations and a number of research findings prove that familiar materials such as MDF or chipboard, melamine or laminate surfaces cannot be used in an ecological kitchen. All in all, a Miinus kitchen undercuts the best indoor air ratings by as much as half, depending on the choice of material and surface treatments. “Development was inspired by our wish to take concrete action for the good of the environment. The goal was to reduce the carbon footprint originating in kitchen manufacturing and to lower the environmental burden throughout the kitchen’s lifecycle. Our mission took on greater importance with the growing demand for ecological alternatives. Our patented Miinus kitchen has now been found to respond to this demand,” says Puustelli Group’s CEO Jussi Aine. There was no research data available for development work since no extensive objective research on materials had been done anywhere else. Development work took years because each solution had to be tested before the injection moulded Miinus biocomposite carcass solution was fully ready for use and goals were reached. Along the way, Puustelli’s development team required numerous researchers specialised in different technologies as well as the know-how, tests, prototypes and 3D models of many parties. Image and video link information attached. Puustelli Group Oy is part of Harjavalta Group, a Finnish family enterprise. The Group also includes Kastelli Group Oy and Lapti Group Oy. In 2017, Harjavalta Group had around 1,100 permanent employees and turnover of around €386 million. The ecological Miinus kitchen has been produced by Puustelli since 2013 and is sold in Finland, Sweden, the UK and USA. Project sales account for a significant share.